I wrote this post for Skeptical Science as a basic rebuttal of the argument “Ice isn’t melting”. Contrary to contrarian claims, ice is melting at accelerating rates in the Arctic, Antarctica, Greenland, and glaciers all over the world. Arctic sea ice has shrunk by an area equal to Western Australia, and could be all gone in a decade. An ice sheet is a huge layer of land ice. The only ice sheets are in Antarctica and Greenland. The Greenland ice sheet is losing mass at an accelerating rate. In recent years the ice loss has spread from the south coast around to the northwest. 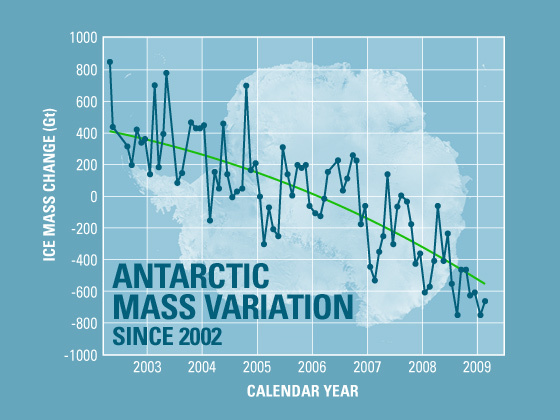 Similarly,Antarctica is also losing ice at an accelerating rate. Antarctica is basically divided into two distinct ice sheets, the West Antarctic and East Antarctic. The East Antarctic ice sheet, which is much bigger than the West Antarctic one, was until recently considered stable, but has also begun losing ice. Ice shelves are thick, floating platforms of ice formed when glaciers flow from the land onto the ocean surface. The Antarctic Peninsula is warming rapidly. Several ice shelves have collapsed completely,including one covering 3,250 km2, almost twice the area of urban Sydney. Glaciers are retreating around the globe. Although one can point to particular glaciers that are growing, glaciologists look for trends in the total mass of glaciers worldwide. It turns out the world’s glaciers are losing ice at an accelerating rate. And despite all the hype about a certain mistake in the 2007 IPCC report, the Himalayan glaciers are in fact melting. Sea ice floats on the ocean surface, and is not to be confused with ice sheets on land. Even though the Antarctic ice sheet is losing mass, the extent of sea ice around the coast of the continent has grown slightly. This is because of a complex variety of factors, and despite the warming of the Southern Ocean. The trend is expected to reverse in coming decades as the Antarctic continues to warm. 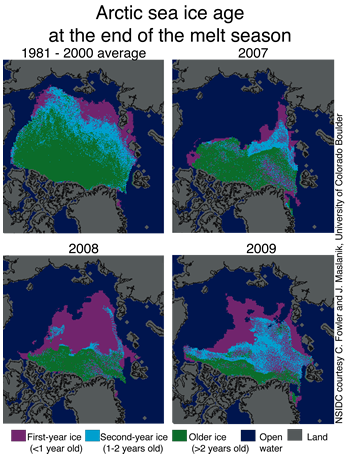 Arctic sea ice in a death spiral? Arctic sea ice grows and shrinks seasonally, with an annual minimum in September. In 1979, when satellites first measured it, September Arctic sea ice extent was roughly equivalent to the area of Australia. Since then it has declined by about a third, equivalent to losing Western Australia – outstripping all projections. 2010 had the third lowest minimum on record (after 2007 and 2008). Two expeditions successfully circumnavigated the Arctic Ocean in a single summer, something that would have been impossible just a few years earlier or any time in recorded history. Contrarians claim Arctic sea ice has “recovered” since the record low extent of 2007. But sea ice exists in three dimensions, and it has continued to thin rapidly. Ice volume data paints a picture even more dire: the Arctic has actually lost not one third but two thirds of September sea ice. What’s more, the volume reached a record low in 2010 – not an encouraging sign of recovery. 2010 set the stage for continued melting. At the end of the summer, a record-breaking 86% of ice cover was less than two years old; ice older than five years has all but disappeared. The remaining new ice is thinner and much easier to melt than older ice. Ice-free summers are now probably inevitable, but it’s not clear how soon because the Arctic is melting much faster than any model predicted. Mark Serreze, Director of the US National Snow and Ice Data Center, says we’re “looking at a seasonally ice-free Arctic in twenty to thirty years.” A few scientists argue that September sea ice could be essentially gone within the next decade.